– Anisur Rahman, former guest-writer in Uppsala. They will read and hold a dialogue with their Swedish ­colleagues Elsie Johansson, Reza Rezvani, Lars Burstedt, Lars Häger and Magnus Dahlerus. 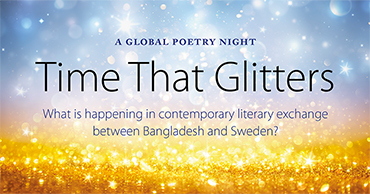 Release of the new anthology Time That Glitters – 8 contemporary poets/writers from Bangladesh and Sweden. Join the release festivities in the bookshop. Refreshments!